The cynicism of Republican legislators has reached new heights with the upcoming Supreme Court lawsuit against Obamacare subsidies with hearings that began Wednesday. Because their lawsuit won't succeed, just as the more than 50 other attempts to block Obamacare haven't succeeded. Yet Republicans have succeeded in slowing its implementation with such tactics by encouraging the possibility that it might be overturned. The main result of Republican shenanigans has been to slow enrollments in Obamacare -- 10.2 million Americans have actually enrolled -- as in paid for -- Obamacare plans for 2015, federal officials said Tuesday. It's 87 percent of the 11.7 million who had signed up by the end of open enrollment in mid-February. But such tactics haven't helped their cause, and may have even decreased their chances of any success in 2016 elections. 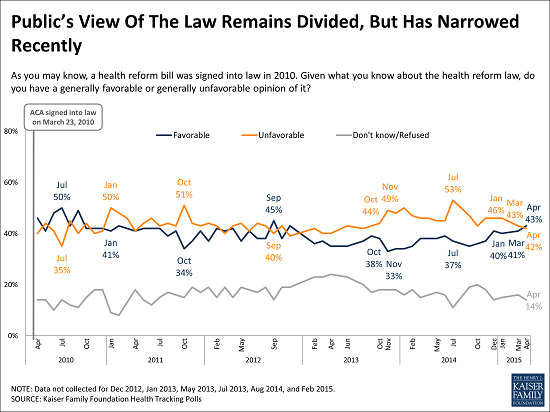 For instance, though April's Kaiser Health Tracking Poll "finds public opinion on the health care law holding steady and closely divided," the share expressing a favorable view (43 percent) exceeds the share with an unfavorable view (42 percent) for the first time since November 2012, albeit by one percentage point. But the difference is within the survey's margin of sampling error and is not statistically significant. 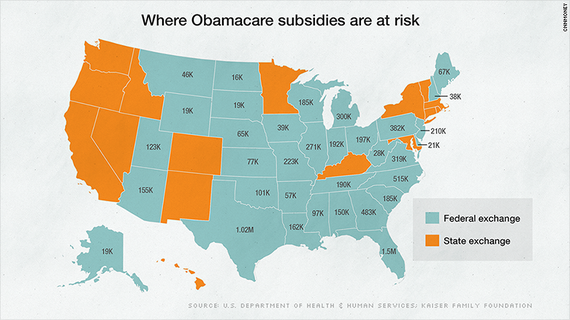 The case, King v. Burwell, contests whether enrollees in these 34 states can receive federal subsidies. The challengers argue that the section of the law governing subsidies -- which refers to exchanges "established by the State" -- applies only to the 16 states with their own exchanges. But legislative precedent plus the huge benefits it bestows on health care recipients (that far outweigh any damage to states' budget coffers, since most ACA costs are federally subsidized, anyway), say that Congress intended the federal subsidies for low-income Medicaid recipients to be applied to all states, regardless of whether states set up their own exchanges. The hurt from Republicans' obstructionism comes even though Obamacare has exceeded the federal estimate that it would enroll 9.1 million people in its second year, but that projection was reduced from an earlier Congressional Budget Office estimate of 13 million. So who knows how many would have signed up and paid premiums, if Republicans didn't use these ultimately failed tactics? The damage to healthcare recipients from an adverse ruling comes from the approximately 6.4 million Americans that could lose their subsidies for health insurance if the Supreme Court rules against the Obama administration this month, according to the federal data. 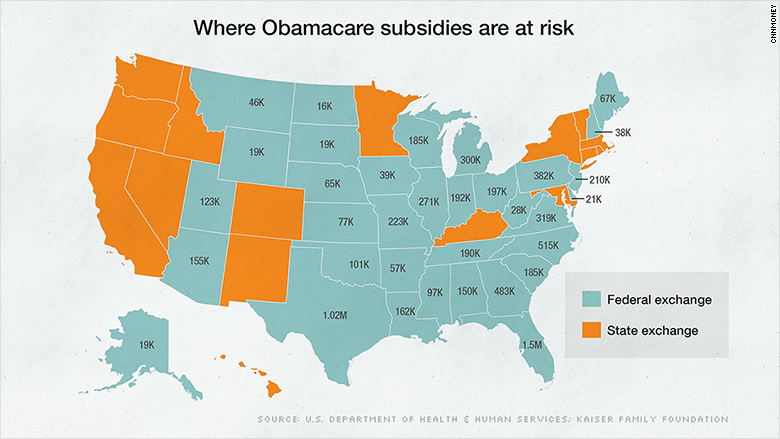 Those 6.4 million are receiving subsidies to help them pay for private insurance in the 34 states that are relying on the federal health insurance marketplace, HealthCare.gov. If the court sides with the challengers, those consumers would lose their subsidies, or about $1.7 billion a month, according to the data. That is real damage, as opposed the any illusory damage to states that haven't set up their own exchanges. These subsidies are key to keeping the whole system afloat. They serve as incentives to attract a wide range of people -- most importantly, younger and healthier ones who might not opt for coverage if it were too pricey. They also mitigate concern over costs from the individual mandate, which requires nearly all Americans to have coverage or pay a penalty. Actually, it's more than cynicism that has to be motivating those House Republicans in particular that have now attempted more than 50 times to block its implementation, as we said. They hadn't been able to do it legislatively, knowing that Senate majorities and the White House are against it being defunded. And the Supreme Court has already approved its overall constitutionality. No, it's really the most conservative branch of the Republican Party wanting to hurt the poorest among U.S. as much as possible. It's really a brutal callousness that cares not for the health and well-being of a majority of Americans, including those hurt most by the Great Recession; in fact for anyone other than their wealthiest constituents.